If you work in the construction industry, the dangers associated with heavy machinery and equipment, although important, shouldn’t be your highest priority. What should be? Gravity. The U.S. Occupational Safety & Health Administration (OSHA) states that falls are the leading cause of construction deaths in the United States. Every year, over three hundred construction fatalities occur as a result of workers falling to their deaths. Since construction projects are most often conducted several feet above street level, a fall can be catastrophic. Scaffolding creates one of the greatest fall hazards. In fact, 40 percent of all construction site fall injuries are caused by scaffolding and ladder accidents. Unprotected sides or wall openings. When the sides of a scaffold aren’t guarded properly, they provide no protection for workers who may get too close to the edge. Unguarded steel rebar. The basic frame of scaffolding is rebar. When that rebar is capped insufficiently, or not at all, the protruding edge can pose significant dangers for workers. 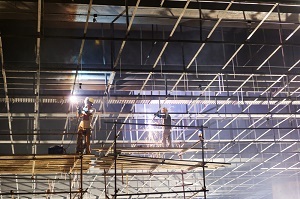 Clothing can snag, workers can trip or lose balance while trying to avoid the protrusion—all of which can cause the worker to fall off the scaffold. Unsafe braces and connectors. When the connections of the scaffolding are not fastened tightly or properly, the stability of the scaffold becomes compromised. A wobbly scaffold has the potential to cause workers to lose balance and fall, or the scaffold itself can collapse. Incomplete assembly. Scaffolds must be constructed prior to use. When a worker fails to follow the safety guidelines, the entire structure (and the safety of all who climb it) can become compromised. Height. Many ladder accidents involve falls from extreme heights, which can end poorly for the worker involved. With high ladders come high risks. Defective equipment. When tools fail, bad things happen. Ladder accidents can be especially dangerous when the ladder you depend on is defective. Negligent coworkers. If you are counting on another coworker to steady your ladder or give you a wide berth while you are vulnerable, his negligence or inattention can cause serious trouble. Inclement weather. If the winds are howling and the rain is pelting down, the chances increase that you may fall or be knocked off your ladder, and so do your chances of serious injury. A hard fall doesn’t necessarily need to have a hard landing. Whether caused by someone else’s negligence or a defective tool, your construction injuries do not have to cost you your future. Depending on the factors of your accident, you may have a viable legal claim to obtain financial compensation for your injuries. The best move you can make is to call an experienced lawyer who can help you learn and understand your rights. Do not delay longer than you should. Call experienced construction accident lawyer Steve Lee today. A FREE consultation about your potential claim is just a phone call away. Call us at 800-232-3711 to schedule your claim’s complimentary review.